18ct White Gold Pavé Set Diamond Dress Ring — Form Bespoke Jewellers Ltd.
A bold and beautiful diamond dress ring pavé set with diamonds. The customer came to us with a 2.55 carat, round brilliant cut diamond that they wanted to use as the centre stone for a bespoke dress ring. Alongside the guidance of our expert team at Form Bespoke Jewellers, a pavé set diamond design was created. To show off the large diamond to its full potential, it was hand set into a rub setting which was open at the sides. This type of setting ensures that plenty of light can flood the facets of the diamonds. 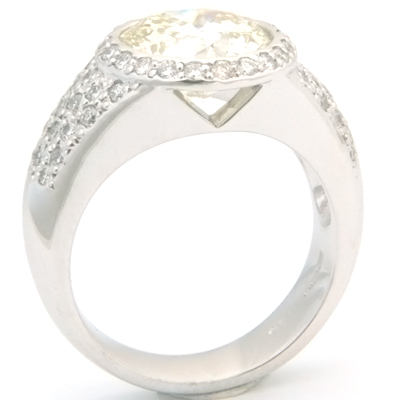 The head of the ring is pavé set with 18 0.01 carat round brilliant cut diamonds. Pavé setting is when the diamonds are set very close to one another and the metal which holds them in place is highly polished. This creates a sparkling illusion. The shoulders are also pavé set with a further 24 0.01 carat round brilliant cut diamonds. This makes a combined diamond weight of 0.42 carats of matching colour and clarity. The ring was cast in 18ct white gold and weighs 11.38 grams. 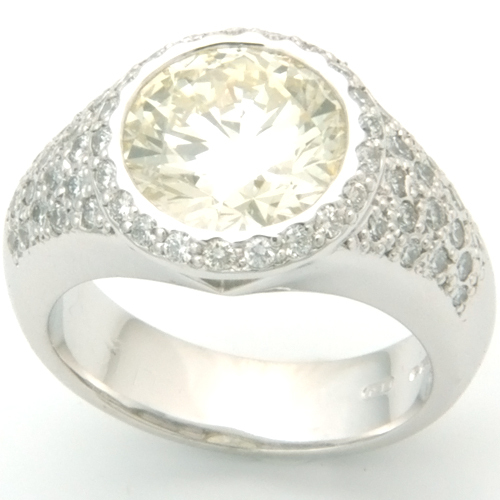 The cool white tone complements the customer’s diamond and the smaller pavé diamonds beautifully. This design really makes a statement and the customer was delighted with the finished ring. A beautiful cocktail style.